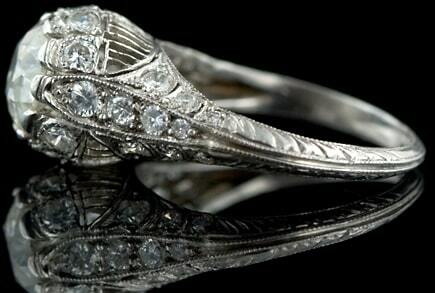 Platinum and Diamond Ring with Millegrained Edges. 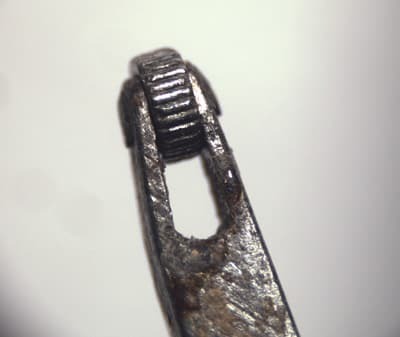 Millegraining is an extremely tiny beaded detail that finishes an edge on a piece of jewelry. The detail is applied as a fine beaded texture, usually on platinum. 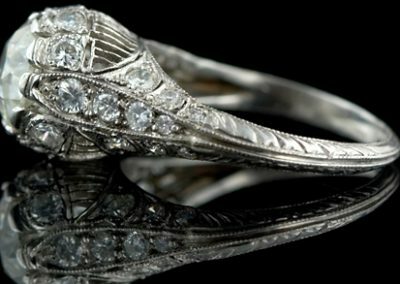 The millegrained edges on platinum can be on a fine wire, a knife edge wire, a bezel setting around a stone, an outline of a pattern or design detail, a channel edge, and as with the beads in gold, used to finish a design detail. The millegraining of the metal edges allow the diamonds and gemstones to sparkle without competing with the reflected light from a highly polished platinum edge. Previous to the use of platinum in jewelry one does see beaded details, but they were not as finely done nor were they used on edges. Beads drawn in gold and silver usually graduate to terminate a line of diamonds and are smaller than the smallest diamonds in the row. They may also be applied in place of diamonds where diamonds would be too large. Millegraining was also used on white gold (Patented in the US in 1915). However, the malleability of platinum lent itself to the finest and most delicate millegraining. A millegrain finish is achieved by rolling a tiny (stainless) steel wheel over the (softer) precious metal edge of the jewelry piece at hand. The wheel in the millegraining tool is engraved with a pattern that will indent some of the material while leaving the desired relief in the precious metal. The diameter of the wheel can be as little as 2 mm. The tool consists of a wooden handle in which a shaft is mounted. At the end of the shaft there is a groove in which the wheel is suspended on a tiny axle. Different engravings on different wheels ensure that a variety of patterns can be created this way. Millegrain Tool. Images Courtesy of the Picciotti Workshop, Rome. 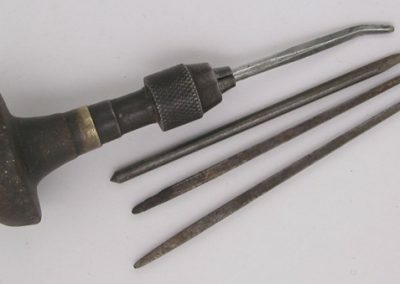 The images below display two millegraining tools from around 1930, one will leave somewhat spherical millegrains, the top one a jagged pattern. 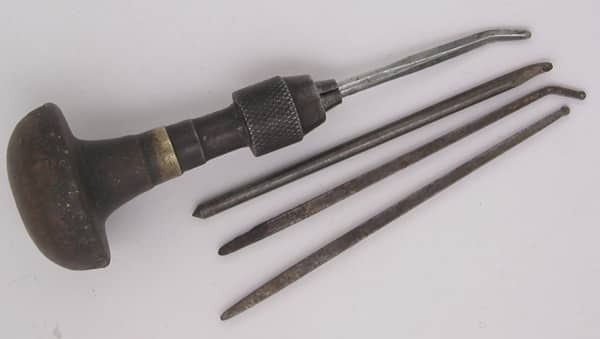 With these tools every part of a ring that can be reached with the wheel can be provided with millegrains. Where the wheel can’t fit, a hollow punch, with the same size design, and a hammer have to do the job. The video below illustrates the use of a modern pneumatically powered millegraining tool. 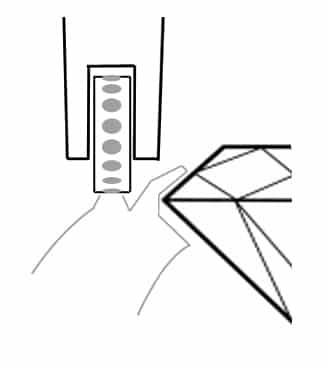 Close-Up of a Millegrain Tool’s Tip that will Leave a Jagged Pattern. 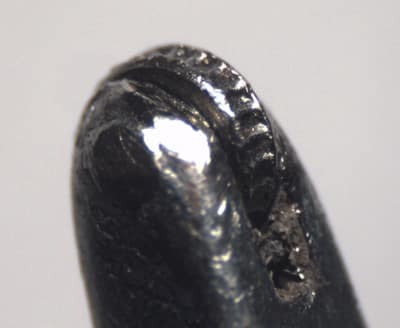 Close-Up of a Millegrain Tool’s Tip which will Produce Spherical Millegrains. Diagram of Millegraining in Process.